Volkswagen installs a new turbo-diesel engine in the TDI Clean Diesel version of the 2015 Passat, while boosting fuel economy ratings for the standard turbocharged, 1.8-liter 4-cylinder engine. Remaining changes pertain to equipment: basic S and Wolfsburg models are now available with a Technology Package; SE model upgrades are consolidated into fewer option packages; and SEL Premium models now include rain-sensing wipers. When buying a 2015 Volkswagen Passat, you first decide what engine you want, and then you decide what trim level you want. All five of the Passat’s trim levels – S, Wolfsburg Edition, SE, Sport Edition, and SEL Premium – are available with the standard turbocharged 4-cylinder engine. 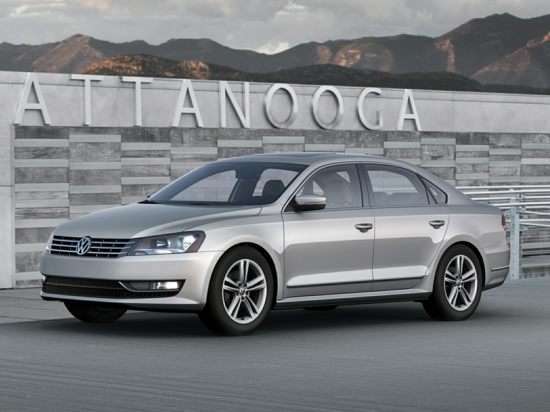 The TDI Clean Diesel and Passat V6 offered only with SE or SEL Premium trim. The Passat 1.8T is equipped with a turbocharged, 1.8-liter 4-cylinder engine generating 170 horsepower and 184 lb.-ft. of torque. A 5-speed manual gearbox is standard for S, SE, and Sport Edition models, with a 6-speed automatic transmission optional. The automatic is included for the Wolfsburg Edition and the SEL Premium. A new turbocharged, 2.0-liter 4-cylinder diesel engine is installed in the TDI Clean Diesel model. It makes 150 horsepower and 236 lb.-ft. of torque, and is paired with a 6-speed manual or 6-speed Direct Shift Gearbox (DSG), the latter an automated manual transmission. For maximum power and performance, the Passat’s 3.6-liter V-6 makes 280 horsepower and 258 lb.-ft. of torque, delivered to the family sedan’s front wheels through a 6-speed DSG transmission. Based on official EPA fuel economy estimates, the Passat TDI Clean Diesel is the most efficient version of the car, rating 34 mpg in combined driving with the DSG transmission and 35 mpg with the manual gearbox. The popular Passat 1.8T gets 28 mpg regardless of transmission choice, while the powerful Passat V6 is rated to return 23 mpg in combined driving. Though the Passat has proven itself to be a safe car, it is not a particularly sophisticated car when it comes to technology. Just last year this model gained Volkswagen’s Car-Net services system, which includes Automatic Collision Notification and Last Parked Location features, among others. Now, for 2015, a new Technology Package is offered for the Passat S and Wolfsburg Edition, supplying the reversing camera and touchscreen radio that are standard for the SE, Sport Edition, and SEL Premium trim levels. Beyond these features, few technology upgrades are offered for the 2015 Passat aside from a navigation system, HD Radio, a premium sound system, and keyless access with push-button engine starting. Some midsize sedan buyers might appreciate the Passat’s old-school simplicity. After all, nothing in this car will issue regular visual or audible warnings of any kind, or unexpectedly attempt to take control of the steering and braking functions. Other people who want these types of features need to shop elsewhere.